Happy Clinic is rated 4.2 out of 5 by 13. Rated 5 out of 5 by Luvago from I can't stop! Usually TM games exhaust me one way or another, but I am addicted to this game from the 1st move. The story line is pleasant, graphics a little cartoonish - doesn't matter! As previously mentioned Hawaiian style music would have been more appropriate in Hawaii - you travel to different hospitals & countries with different ailments to be treated etc. The fact that that I had to be organized with my actions was very satisfying to me - shows I can still do the job in my 70s !!! :) Trouble is it was too short for my level of addiction! Once I start, real life goes out the window - Help! I do hope another, longer version comes along soon. 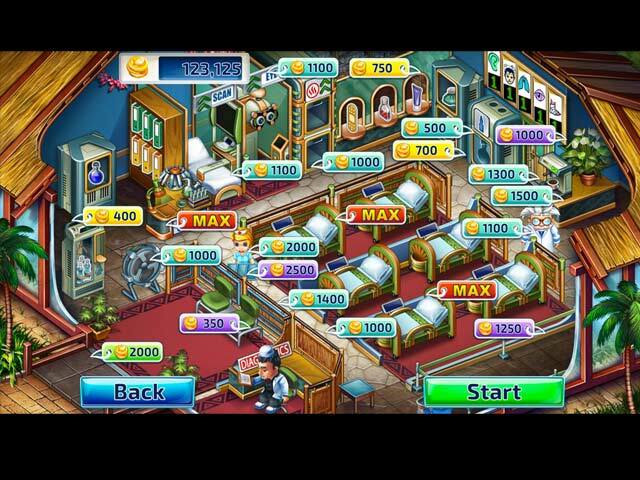 Rated 5 out of 5 by amylmenke from Great hospital game! I have come back and played this game numerous times. Very fun game. No issues whatsoever with clicking or her being too slow. Very easy to get Expert on every level. I do wish they had an expert mode you could play on but that's ok. I recommend. It's one of my favorites lately. Rated 5 out of 5 by SteveStewart from Great Game Great little game. Only complaint was that it was too short. I wish it had more levels. Great gameplay. You will enjoy it. Rated 5 out of 5 by violet922 from Though I Wouldn't Like It... But I thought this game would be too busy for me to really enjoy, but I was wrong. Once you get a routine going, it is very enjoyable and quite addictive. The Collector version came out first, which I passed on. Was so happy the Standard version came out rather quickly. The difference between the two are 2 additional levels, which I wish were available but I can't see spending two game credits for two extra locations. The one thing I don't like is; in some of these games the developers put the wrong music for a location. For example, one of the clinics is located in Hawaii but they play Caribbean music which is kind of insulting for Hawaiians. Other than that, I hope there is a second version of Happy Clinic. I will gladly buy it. Loved this one very much! Rated 5 out of 5 by pennmom36 from TREATING ONE PATIENT AT A TIME, SOMETIMES TWO, OR THREE The more patients that arrive, the slower I get, which clearly tells me I shouldn't be a nurse! Oh well, it's still a fun game! As you progress, other Hospital Clinics become available starting in Australia, then Mexico, Canada, Hawaii and New York. I love this Hospital themed Time Management game, and I'm glad this Standard Edition has finally been released, because I just can't see paying twice as much, just to get a few extra levels in the Collector's Edition. Patients enter the clinic with their medical issue in a thought bubble, and then you drag them to a hospital bed, or a chair if no bed is available. (Once in a bed, the patient will no longer lose their "health") The nurse must then call a doctor or the Professor, each doctor has a specific expertise, the Professor can treat any condition. It is the nurse's job to deliver items requested by the doctor, such as getting medicine at the pharmacy or getting the patient's medical chart, or going to the warehouse for supplies, and the nurse must clean the bed sheets and dispose of them after each patient leaves. Each item takes up a slot on the nurse's tray which can be upgraded to hold more. A Converter is used to process some of the items, and will need to be picked back up by the nurse when it's ready. Some patients need to be placed in a Treatment Chamber (sounds medieval?) others require further testing in the Laboratory. The Med-O-Matic Chamber can treat patients without a doctor (now that's more like it!) There is also a DNA matching Mini Game available. Really the only extras the Collector's Edition seems to offer is a few Wallpapers, a few Bonus Levels and 40 Achievements, (35 of which are still offered in the SE version) Happy Clinic is a fun TM game, and just as fun in this Standard Edition, enjoy! 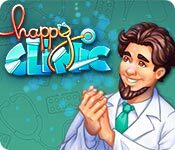 Rated 4 out of 5 by beckyjean from Happy With the Clinic So far I am loving this time management game. I haven't found any glitches. The storyline is really cute. I keep going when I need to get off the computer because I want to follow the story a little more. My favorite type of time management game. Rated 4 out of 5 by vianna1111 from Cute Game I enjoyed playing this game, my only complaints were that is wasn't as challenging as I'd hoped, and was over to quickly. Rated 4 out of 5 by grandmacathy from One little nurse cannot keep up!! I'm a retired nurse, and there is no way a hospital or clinic would run without a nurse's aide or 3! Esp at this pace. Beyond that, the graphics are great, and the story line is good. I just wish I could have another nurse instead of just a faster one. People don't like to wait. And making those beds takes time. Besides not being able to throw the laundry into the hamper in the hall and having to go all the way to the guy at the bottom of the screen. I'm not that crazy about these kinds of games because I'm a perfectionist and want to get it all done in the amount of time I have. That's not how these games are set up. It was a lot more fun to me that Diner Dash with the crying babies and made customers. The people need a chill pill!! 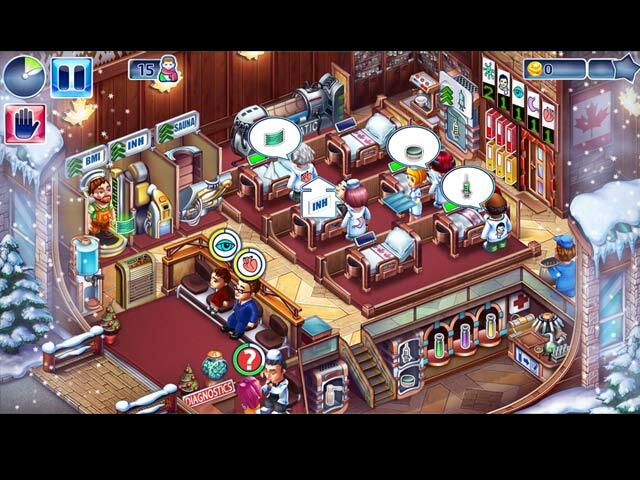 Rated 4 out of 5 by CyndiLouWho2 from Fun, fast paced game with lots going on! Everything is really cute about this game. One of the doctors looks like Albert Einstein, which is too funny. All of the characters are adorable, and I found their motions and reactions quite entertaining. Completing actions seems to take forever in the first several levels until you're able to purchase upgrades. And there are TONS of upgrades that become available all at once. So, it's up to you to decide which ones to purchase first, which I like. Take time to look at each upgrade or you may miss an important one. There are a couple of things that kept me from giving Happy Clinic five stars. First, there's a DNA mini game that appears a couple of times at each hospital location. It's the same game, it's boring and I never really did figure out how to play it. It's easily skipable but if you complete it, you'll earn more money for upgrades. The second thing, once again, is that the upgrades are not clearly marked so you have to click on each and every one of them to figure out what they are. Bottom line: This is a fun, fast paced game with lots going on and I highly recommend you try it for an hour! Rated 4 out of 5 by typpo from Fun Time Management Has a relaxed mode and that I love about any timed management game. Gets more difficult as you play up the levels in different cities which all have something different in them, which increases the fun level. I recommend this game!